History-mystery. Words in the present speak to you from the past. 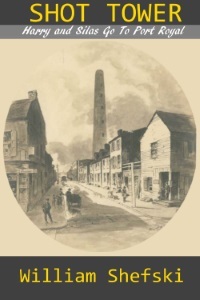 Shot Tower, a historical fiction set in Civil War Philadelphia, is a coming of age story about Harry, the teenage son of Irish immigrants and his best friend Silas, a black from a Quaker family. When Harry’s mother is murdered at her loom, the two boys travel south in search of her killer where they witness the Battle of Port Royal, test the bonds of their friendship, and return to Philadelphia as men. Click here to see Shot Tower coverage in the Sooth Philly Review. The voice of the new Patrick O’Brian.